Halfway between Wellington and Auckland, 14 fully air conditioned ground floor units allows travelers to enjoy all that you would expect in a motel. Majority of the units allow cooking, comfortable bed, unlimited wifi and free calls within NZ. Guests complement us on the shower pressure, outdoor spa and SKY Guest select 50+ channels in selected rooms. Pets are welcome in some of the rooms. 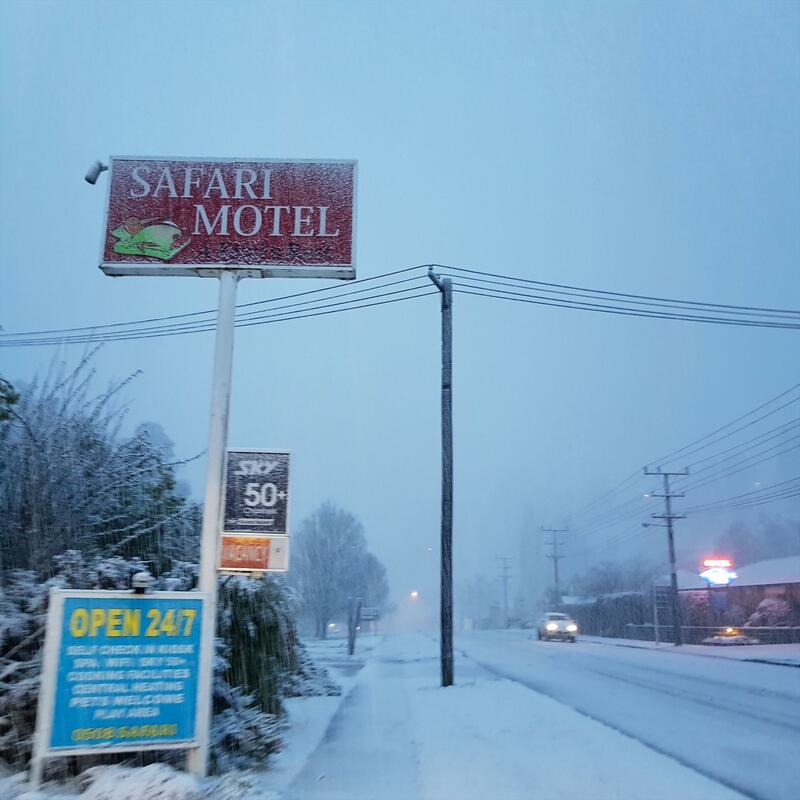 Located at the foothill of Mt Stewart Reserve, you have the option to go for a stroll and Mt Ruapehu Ski fields being only 40 minutes drive away many guests prefer to stay with us and enjoy affordable prices. We are only 50 meters from the nearest restaurant that serves all the meals and guests have the option to charge back. The famous gumboot is only a gumboot throw away - come and a have a go at it! Adjoining Mt Stewart Reserve. 5 hours from Auckland, 3 hours from Wellington. Licensed restaurants across the road. Pets by arrangement. Late arrivals by arrangement. Specials, discounts & seasonal rates. 14 spacious ground-floor units, serviced daily. Refurbishment underway. New central heating. 10 units with fully equipped kitchen. All have tea, coffee and toast-making facilities, microwave, fridge, ensuite with shower, hairdryer, 5-channel Sky Digital TV, wireless broadband internet access and electric blankets. Iron, ironing board, cot and highchair are available. Continental and cooked breakfast, charge-back meals and morning paper are also available. Laundry facilities, BBQ and trampoline. Approx 500 metres to town and 70km to ski field. All major credit cards and EFTPOS accepted. Friendly owner-operators: Di & Tom..
Halfway between Wellington and Auckland, 14 fully air conditioned ground floor units allows travelers to enjoy all that you would expect in a motel. . . . More . . .